New to the series of tactical LED flashlight products is the extremely high power 1200 lumen FLX light by Barska. Hand held or weapon mounted the Barska 1200 lumen light brightens up any dark situation. The FLX 1200 comes ready to go with rechargeable batteries and charger. 1200 lumen LED flashlight uses constant current technology. Barska, a leading manufacture of sport optics and accessories has newly designed a 1200 lumen tactical LED flashlight. This newly designed flashlight features an extremely bright 1200 lumen LED light. This new high intensity light is powered by 2 rechargeable lithium batteries, which are included with the Barska FLX package. Functional, the Barska 1200 FLX Flashlight features multiple function modes such as, a SOS rescue mode and a disorientating strobe mode. Barska has designed the 1200 lumen FLX flashlight to be shockproof, to withstand extreme conditions and punishing use over extended periods of time. The powerful 1200 lumen FLX tactical flashlight (model BA11630) features not only a new high power LED technology but also has advanced constant current technology. The 1200 lumen LED flashlight uses constant current technology to provide a stable output of continues light. Normal flashlights that don’t have the constant current technology will dim as the batteries loose power. 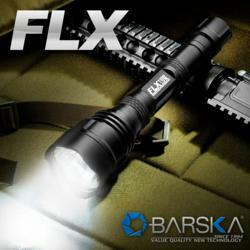 The Barska FLX flashlight will not dim as the batteries loose power. The Barska tactical flashlight will be consistently bright from the first minute of use to the last minute. Designed with utility and function in mind, the Barska 1200 FLX tactical flashlight has five operation modes. The operation modes can be quickly accessed and changed via the multifunction on / off button at the back of the light. Give one full push to turn the unit on or off, which will also reset the modes. When the light is on, lightly push the button to cycle thru modes. The built-in modes include SOS rescue pattern, strobe light, high power and low power. The low power modes can effectively double the life span of a set of charged batteries. The strobe mode is intended to used as a self-defense feature by momentarily blinding / disorientating an attacker. Manufactured from solid yet light wait T6 aluminum, this tactical LED flashlight is built to withstand rugged use and extreme elements. This shockproof design allows the flashlight to be mounted to rifles for night targeting using optional Barska mounting rings and mounts. The tactical edge of the product allows use as a handheld self-defense tool. The FLX 1200 lumen tactical flashlight comes with a set of rechargeable batteries and charger. This LED tactical light is backed by the Barska one-year flashlight warranty.